But despite Ivy’s emphatic claim, Heritage Auction Galleries in Dallas, Texas, is offering more fakes and frauds in its Platinum Night Auction scheduled for July 31st at The House of Blues in Cleveland in conjunction with the National Sports Collectors Convention. Ivy recently raised some eyebrows when a Heritage press release was picked up by the Associated Press and ESPN advertising the upcoming sale of an alleged Lou Gehrig signed ticket from “Gehrig Day” in 1939 that he calls “the most significant baseball ticket in the world.” The AP reports that the ticket is “estimated to bring over $100,000″ at the live event in Cleveland. Several experts and hobby observers, however, think that the Gehrig signature on the ticket is not genuine, but even more disturbing is another Heritage lot in the glitzy auction catalog that has been identified as a counterfeit 1882 Cincinnati Reds presentational pocket watch attributed to 19th-century star Charlie Gould. 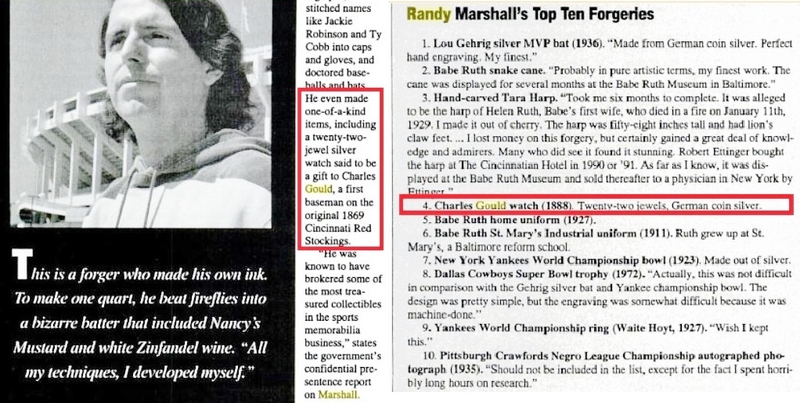 The auction house estimates the timepiece could sell for over $60,000 but the alleged 1882 Reds championship watch is actually a well-documented fake created by early 1990’s forger Randy Lee Marshall. Marshall, a former batboy for the Reds, was convicted in 1993 for mail and wire fraud and was sentenced to twenty one months in prison as a result of an FBI investigation. Marshall identified the watch currently being offered by Heritage on his own personal “Top 10 Forgeries” list which was published in Cincinnati Magazine in 1995 (the article incorrectly identified the watch as being dated 1888). In addition to peddling that historic fake, Heritage is also continuing its unfettered sales of stolen documents from the National Baseball Hall of Fame in Cooperstown with the offering of a 1923 letter written by Christy Mathewson protesting a game between the Boston Braves and Brooklyn Dodgers in 1923. The National Baseball Library’s files house the August Herrmann Papers collection which includes letters and affidavits for protested games in the National League spanning from 1902 to 1926. Wolfers estimated the value at $15,000-17,500 and the boots ended up selling for $3,300. The Wright boots were again recently identified as fakes in a post published by researcher Jimmy Leiderman at The New York Clipper in 2012. The Taft watch, said to be presented to the President at the dedication of Redland Field in 1912, includes similar forged documents including a 1952 letter from Senator Taft to Clark Griffith. 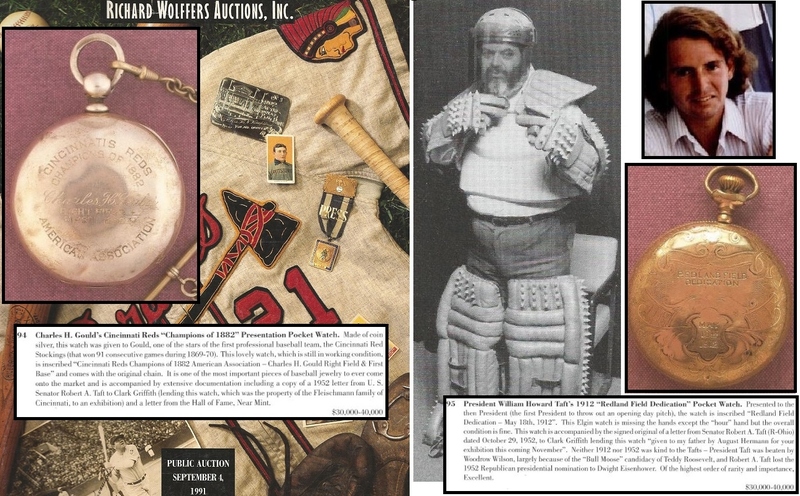 Duane Garrett (center) offered the bogus 1882 Reds watch for sale in his 1991 "Treasures of The Game" auction at Richard Wolfers in San Francisco. The watch had the same alleged provenance as another counterfeit watch attributed to President William Howard Taft. Both watches were created by convicted forger Randall Lee Marshall (inset top right). 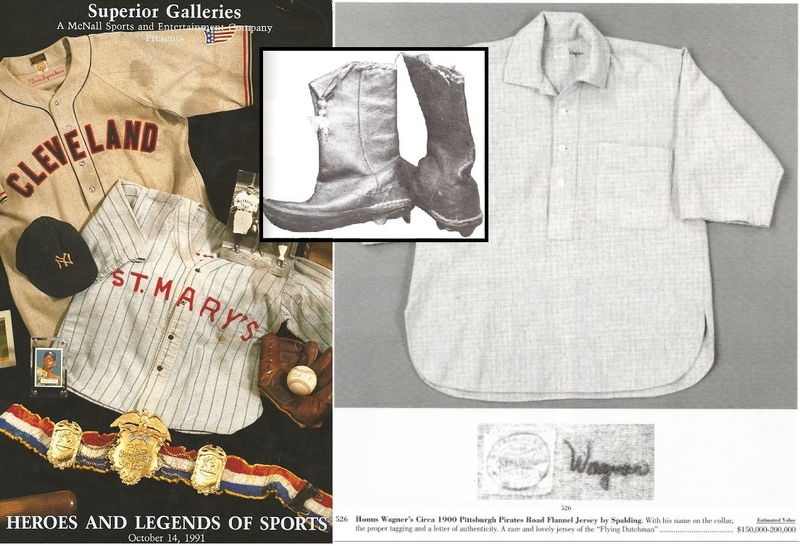 Randy Marshall's forgeries ended up in major auctions including: Babe Ruth's St. Mary's jersey (left) which appeared on the cover of both Superior and Wolfers catalogs in 1991; Harry Wright's boots (inset) in Wolfers; and Honus Wagner's c.1900 jersey at Wolfers in 1995 (right). At the time Marshall’s forgeries were circulating in the hobby, current Heritage consignment directors Mark Jordan and Mike Gutierrez were working for Wolfers and Duane Garrett as consignment agents and authenticators. After the bogus Babe Ruth St. Mary’s uniform failed to sell at Wolfers in 1991 it resurfaced in two later sales held by Superior Auctions in Beverly Hills in 1992 and 1993 when Gutierrez was working exclusively for LA Kings owner Bruce McNall as Superior’s baseball consultant. By the time Randy Marshall was convicted and his creations were identified in the press, Mark Jordan had already authenticated hundreds of thousands of dollars of other forged items that had appeared in Wolfers sales. After this writer and several other experts and hobbyists illustrated how many forgeries were appearing in the Wolfers auction catalogs the once prominent auction house lost credibility and faced further scrutiny which led to auction founder Duane Garrett’s alleged suicide jump off the Golden Gate Bridge. Ex-Cincinnati Reds batboy Randy Lee Marshall was convicted after an FBI investigation that included his admission that he created an engraved pocket watch presented to Charlie Gould. 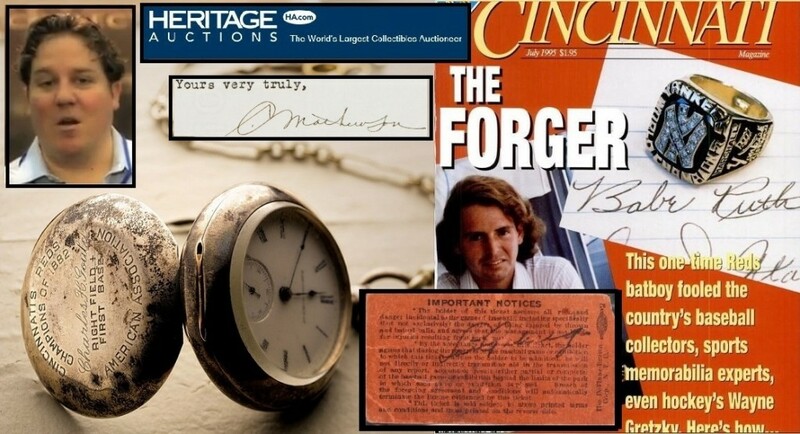 The watch appears on a "Top 10" list of Marshall's forgeries published in Cincinnati Magazine in 1995 (right). According to Cincinnati Magazine, Marshall also used the alias, Geoff Wayne, and created scores of forgeries that made their way into other major auctions as well as exhibits at the Babe Ruth Museum in Baltimore, Maryland. There were also talks of one of Marshall’s Ruth fakes even landing in a display case at the FBI office in Minneapolis. Marshall created other relics ranging from Yankee pitcher Waite Hoyt’s 1927 World Series ring to a silver bat he crafted as Lou Gehrig’s 1936 MVP award which he called his “finest” work. Heritage is currently offering another 1927 Yankee World Series ring attributed to Earle Combs, but that ring appears to be authentic and originates from Combs’ grandson. Marshall also ventured into football items and created a 1972 Dallas Cowboys Super Bowl trophy. The current Heritage sale includes two misrepresented Pittsburgh Steeler Super Bowl rings that have been doctored with unofficial engraving and appear to be salesman’s samples. The Reds erected a monument above Charlie Gould's grave in 1951 and forger Randy Marshall created a fake watch allegedly honoring him in 1882. Marshall also created a bogus watch he said was presented to President Taft at the dedication of Redland Field in 1912. The evidence that Heritage’s 1882 Reds watch is a fake is so overwhelming one has to question what type of due diligence Chris Ivy, Mike Gutierrez, Mark Jordan, Rob Rosen and Derek Grady conduct when it comes to vetting major items appearing in HA sales. Hauls of Shame has identified other alleged fakes that Heritage has offered including the “last out ball” from the 1917 World Series. The auction house removed that ball from a 2012 sale when our report illustrated that the ball wasn’t manufactured until 1926. More recently, Heritage proceeded with the sale of a bogus document said to bear the rare autograph of HOFer John M. Ward, despite the fact that Hauls of Shame and other experts definitively identified the Ward autograph as an obvious secretarial signature. Randy Marshall, who currently lives in Saint Augustine, Florida, and operates an online collectibles store called “Dead Peoples Things” did not respond to our request for comment. The Lou Gehrig signed ticket in the current HA sale (right) has been identified as a forgery by experts and is similar in construction to two other single-signed Gehrig balls sold at HA and Mastro Auctions (left). In 2012, Heritage offered a single-signed Lou Gehrig baseball that several experts, including author Ron Keurajian, opined was a forgery. The ball was signed on an official American League ball believed to have been manufactured in 1940 when Gehrig could not have signed the ball due to his physical condition. Heritage removed the ball from the sale as a result of our report but later returned the same ball to a 2013 auction after they uncovered evidence suggesting that it was possible for Gehrig to have signed that particular type of AL baseball in late 1939. But even if Gehrig could have signed the ball sometime in 1939, that fact appears irrelevant based upon the opinions that the Gehrig signature on the ball is not genuine. The signature on the Heritage ball and the signature on the ticket currently being offered for sale are both inconsistent with other verifiable authentic signatures executed by Gehrig during the same period during 1939. 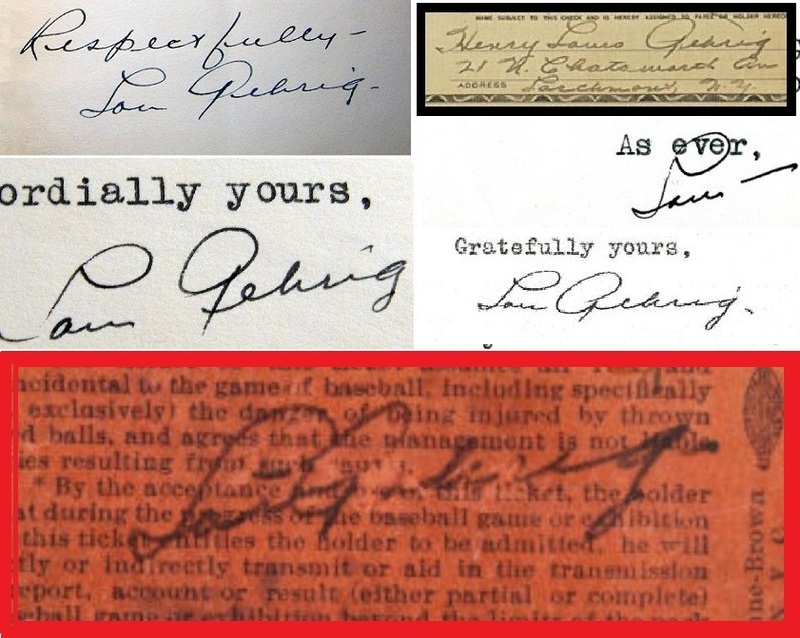 Authentic Lou Gehrig signatures executed in the summer of 1939 contrast the alleged Gehrig signature on the ticket being offered by Heritage (bottom in red). The genuine Gehrig signatures appear clockwise from top left: 1. July 16, 1939 letter; 2. June 20, 1939 check to Mayo clinic; 3. Letter to Doctor from September, 1939; 4. Letter from July 7, 1939; 5. Letter from 1939 on PSA "Autograph Facts" page. The “Gehrig-Day” ticket signature appears to have been executed with considerable hesitation and stoppages causing uneven ink flow and awkward letter construction, which are all tell-tale signs of forgery. The ticket also features several sections of paper loss which have obscured parts of the signature and appear may have been done intentionally to remove other mistakes made in the execution of the forgery. One expert told us that the signature on the ticket looks as if someone used other Gehrig forgeries signed on baseballs as an exemplar. While PSA/DNA and Steve Grad have authenticated the ticket and encapsulated it in a plastic holder, anyone with a background in handwriting analysis can identify the numerous differences between the Heritage signature and genuine Gehrig handwriting samples from the same time period. While Heritage appears to be offering bogus Gehrig autographs on a regular basis, they are also pushing forward with their steady flow of documents believed to have been stolen from the National Baseball Library in Cooperstown. This time Ivy and Co. are offering a 1923 letter written by Boston executive Christy Mathewson to NL President John Heydler protesting a home run call in a game played against the Dodgers on July 4, 1923. 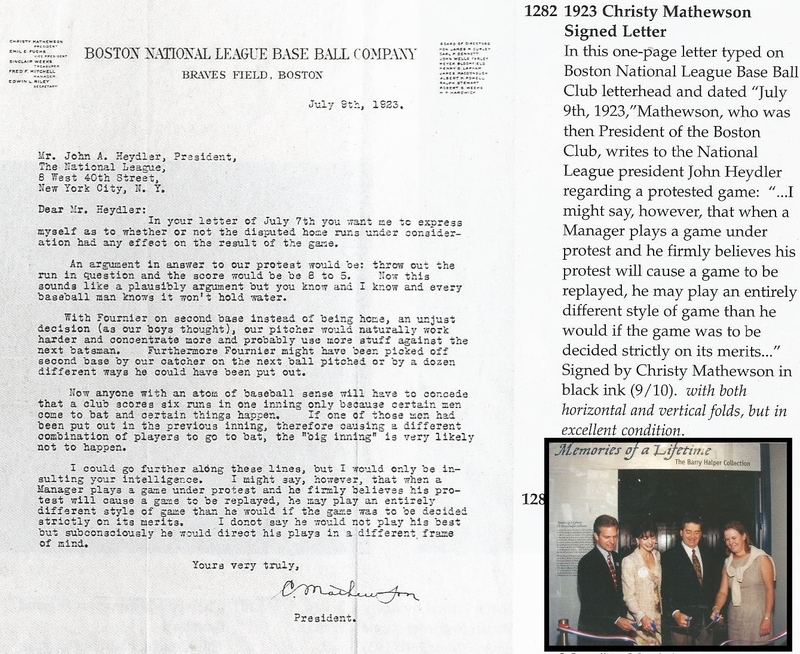 The 1923 Matty protest letter being offered by HA (left) is missing from the HOF's "Herrmann Papers" file "Folder 24" from "Box 44" which still retains an affidavit signed by Brave Fred Mitchell protesting the exact same game against the Brooklyn Dodgers. The Mathewson letter which has an estimated value of “$15,000 and up” appears as lot 80059 and is just one of several documents originally housed in the Hall’s August Herrmann Papers donated in 1961 by Reds owner Powell Crosley Jr. The same Hall of Fame files still retain the letter initially protesting the game penned by Boston Brave manager Fred Mitchell sent to Heydler on July 4, 1923, and describing the same disputed home run that Mathewson documents in the July 6th letter being offered by Heritage. Mathewson’s missive references Mitchell’s letter stating, “I am in receipt from you (a) copy of Manager Mitchell’s protest in regard to the Boston-Brooklyn Game at Brooklyn, July 4th.” How could the Matty letter addressed to the National League and referencing the same letter still found in the HOF files end up in private hands and a Heritage sale? It’s the same question that’s been asked about Chris Ivy’s inclusion of other letters originating from the Herrmann files written by Honus Wagner and Barney Dreyfus that appeared in Heritage’s last sale. 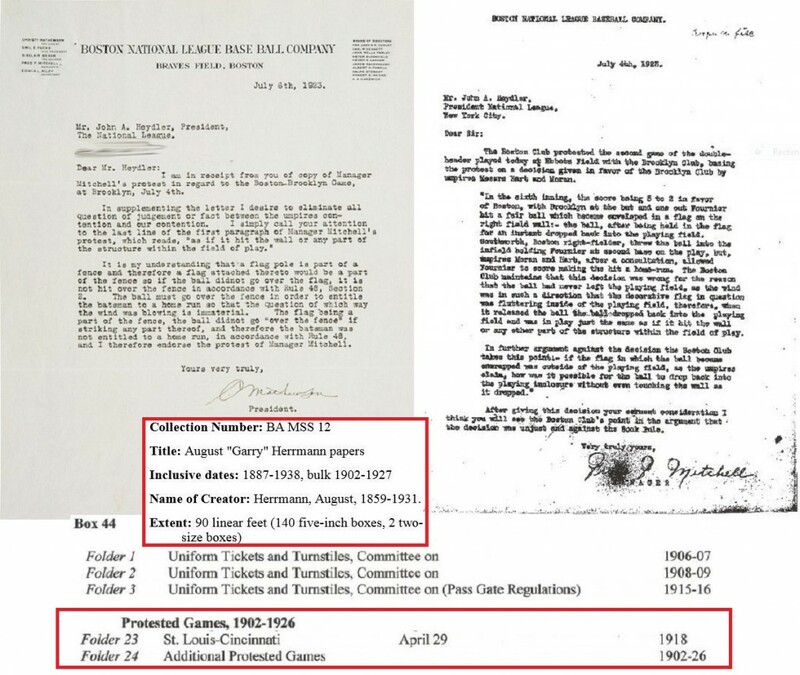 Those letters join other alleged stolen documents offered by Heritage in the past including examples written by Babe Ruth and the 1915 Red Sox team, Charles Comiskey, Fred Clarke, Joe Tinker, AL President Ban Johnson, and Ed Barrow. Two others originating from the Hall were written by Miller Huggins and Hank O’Day and were sold recently at Heritage by autograph dealer Jack Smalling who claims the two letters were given to him in the 1960’s as a gift from Hall of Fame historian Lee Allen. Allen, however, had no authority to gift the documents to Smalling at the time since the documents had become the property of New York State after they were donated. Another Mathewson protest letter believed to have been stolen from the Hall of Fame appeared as part of the Barry Halper Collection at Sotheby's in 1999. Halper and Jane Forbes Clark (inset) cut the ribbon for the grand opening of the Hall's "Halper Gallery" in 1999. The gallery dedicated in Halper's honor no longer exists. Another Mathewson letter from the same Herrmann Papers file and regarding the same protested game of July 4, 1923, appeared for sale as part of the Barry Halper Collection at Sotheby’s in 1999. Halper and his hand-picked consultant, Rob Lifson, included in the sale a large group of items stolen from the New York Public Library, Boston Public Library, Hillerich & Bradsby Co. and the Baseball Hall of Fame. All of the stolen documents were authenticated for Sotheby’s by current Heritage consignment director Mike Gutierrez. One of the first public sales of a letter addressed to August Herrmann at auction occurred in May of 1991 at Richard Wolfers when Gutierrez was listed in the company’s catalog as an “auction agent” along with current Heritage employee Mark Jordan. Sources indicate that a 1926 letter written to Herrmann by John C. Hendricks regarding “being swindled by John McGraw,” was secured for auction by Gutierrez as one of Duane Garrett’s agents. File folder 19 from box 24 of the Hall of Fame’s Herrmann archive includes correspondence between Hendricks and Herrmann between 1924 to 1926 when Hendricks was the Reds manager. The letter appeared in a Wolfers catalog that advertised the September 1991 “Treasures” auction that would feature the very same bogus 1882 watch that is now appearing for sale next week at the National in Cleveland along with the stolen Mathewson letter. The May 1991 Wolfers catalog lists as "auction agents" current Heritage employees Mark Jordan and Mike Gutierrez. That sale featured one of the first public sales of an August Herrmann letter sourced to Gutierrez (inset). 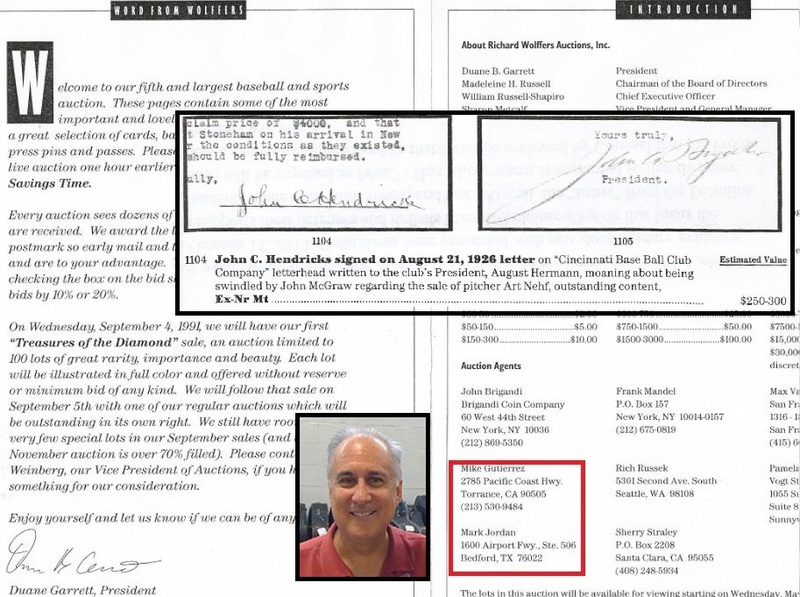 Gutierrez was also familiar with the Herrmann material having authenticated other National League protest documents for Sotheby’s in 1999 including letters by the likes of HOFers Fred Clarke, John J. McGraw, Bill Klem, Joe Tinker, John Evers and Mathewson. Other letters stolen from the Hall and sold by Halper at Sotheby’s originated from Ford Frick’s file of thank you letters from players who received lifetime passes including Jesse Burkett, George Wright, Sliding Billy Hamilton and Jimmy Collins. Back in the late 1980s, Gutierrez became the prime suspect in an FBI investigation into the Hall of Fame thefts after he sold a stolen Babe Ruth photo to New York auctioneer Josh Evans and was further implicated after a man who accompanied him on a trip to the Hall of Fame library told investigators he saw Gutierrez stealing documents from the Herrmann archive and placing them in his brief case. Less than two years after that accusation, Herrmann documents began surfacing in auction sales conducted by Wolfers and Superior at a time when Gutierrez was affiliated with both companies. Fearing backlash from current and future donors, Hall of Fame officials failed to press charges and pursue recovery and since that time the institution has failed to claim title to any of the stolen documents that have surfaced in the marketplace, mostly via sales at Heritage. Several reports of the thefts have recently been filed at the local Cooperstown Police Department but without the Hall’s own filings and cooperation, police officials can do little to recover the stolen property. Hall of Fame officials including PR rep Brad Horn and President Jeff Idelson did not respond to requests for comment on the current Mathewson offering at Heritage. Heritage’s Sports Director, Chris Ivy, has told Hauls of Shame on numerous occasions that unless the Hall of Fame claims title to the stolen Herrmann letters they are offering for sale, the auction house will not withdraw the lot and will proceed with the sales to the general public. Chris Ivy (left) removed a bogus 1882 Reds pocket watch and two fraudulent Super Bowl rings from HA's current auction. Heritage VP Rob Rosen (right) purchased questioned Gehrig Day ticket. A few days after we published our initial report identifying Heritage Auction’s 1882 Cincinnati Reds Championship pocket watch as a forgery created by ex-Reds bat boy Randy Marshall, the auction house removed the fraudulent lot from its upcoming sale slated for this Saturday at The House of Blues in Cleveland, Ohio. Heritage estimated the watch would sell in excess of $60,000. In addition, Heritage also removed two fraudulent Pittsburgh Steelers Super Bowl rings attributed to an alleged practice player named Donnie Edwards. The rings dated from 1975 and 1978 were identified by Michael Borkin of Sports-Rings.com as salesman’s sample examples that had been doctored with non-official engraving. According to Borkin he informed the Heritage consignor of the issues with the two rings before he consigned the items and also informed Heritage Sports Director, Chris Ivy, of the authenticity issues after they were consigned. Ivy did not remove the rings from the sale as quickly as he withdrew the fake 1882 Reds pocket watch, but the rings vanished from the HA website without a trace earlier this week. All three counterfeit items are still featured in the Heritage Platinum Night auction catalog and were expected to realize a combined auction sales price of $150,000 to $200,000. Several sources indicate that Heritage and the consignors of all three of the fraudulent lots had reason to believe the items were not genuine, yet still placed the items in the public auction in an attempt to unload them on unwitting auction customers. Despite the fact that several experts say an alleged Lou Gehrig-signed “Gehrig Day” ticket is non-genuine, Heritage has chosen not to remove that controversial lot from its current sale. Sources indicate that Heritage Vice President and consignment director, Rob Rosen, purchased the same ticket at a fraction of Heritage’s estimated value of $100,000, but it is unclear if Rosen was the actual Heritage consignor for the sale in Cleveland on Saturday. Hauls of Shame asked Rosen via email if he is the consignor of the 1939 ticket but the Heritage employee did not respond to the inquiry to deny he was the current owner of the questioned item. Look out for an upcoming Hauls of Shame report which goes into more detail as to why Heritage gets away with offering and distributing so many verified and alleged fakes in the marketplace. Heritage is still offering the Christy Mathewson protested game letter believed to have been stolen from the August Herrmann Papers archive housed in the National Baseball Library in Cooperstown. The letter has a current bid of $9,000. The controversial Lou Gehrig Day signed ticket offered by Heritage Auctions earlier this evening realized a sales price of $95,600 at The House of Blues in Cleveland as the second day of the National Sports Collectors Convention came to a close. 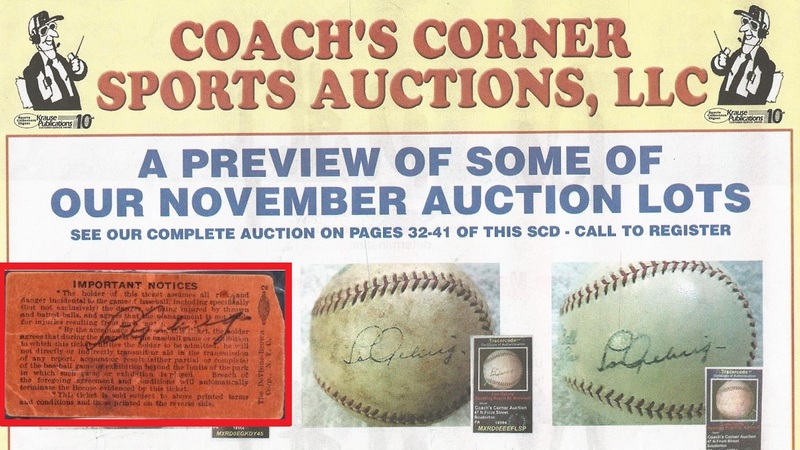 Earlier in the day Hauls of Shame asked several experts in the field for their opinion of an image of the Heritage Gehrig ticket displayed alongside two Gehrig forgeries offered by Coach’s Corner on the inside cover of an SCD issue published in 2002. It was our opinion that the Heritage example was more poorly executed than the CCSA examples. The Heritage "Gehrig-Day" signed ticket (left) appears next to two Lou Gehrig forgeries executed on baseballs which appeared in a 2002 Coach's Corner auction. According to these experts, it appears someone just took home a very expensive ticket that was never signed by Lou Gehrig. great info, thank you for all the facts. like i have been saying for years, heritage auctions is knowingly selling fake and bogus items, and has been for many years! chris ivy is a liar, and i would not be surprised if he has a criminal background as well! Could there be a better example of how inept and unethical Ivyand Heritage are? A forger identifies his work in a publication and not only does HA not properly vet the item they keep it up for sale on their website after they are exposed. How pathetic. And watch them try to act like they DON’T have a full set of 1995 back issues of Cincinnati Magazine in their reference library! Puh-leeze! Heritage is in Texas, not on the frickin’ moon! Heritage has withdrawn the 1882 Reds watch from the Platinum Night auction scheduled for July 31st at the National in Cleveland.